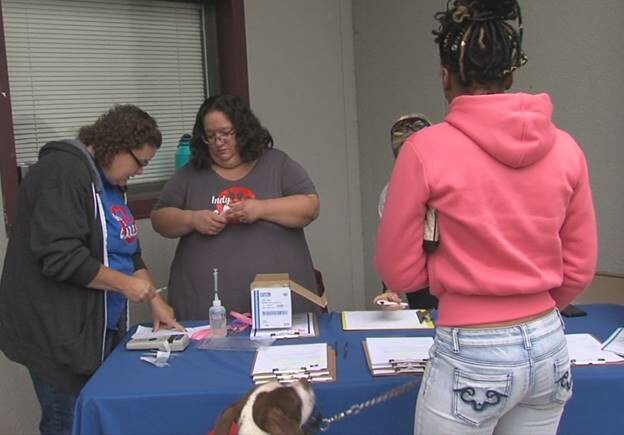 INDIANAPOLIS — On any given day, a line of people and cars stretch along the back side of the Indianapolis Animal Care Services shelter on South Harding Street -- it’s pet owners looking to surrender their dogs and cats. Their reasons vary — they can’t afford food or medical care, their landlord won’t let them keep the pet, they’re moving, or perhaps they found the dog or cat as a stray. Every year, the city takes in 14,000 animals a year and the shelter is busting at the seams nearly every single day. A new effort is underway to stop the flow of unwanted animals into the city shelter. Indy Cares, a group of volunteers which mobilized earlier this year, sits at the back door as a last-ditch effort. “Indy Cares is a program that tries to keep the animals in their homes rather than coming into the shelter,” said Erin Randall, a volunteer with Indy Cares. As RTV6 was there, a woman surrendered her dog, telling Indy Cares volunteers that her landlord said the pet was too big. “If we paid the pet deposit would that change anything?” asked an Indy Cares volunteer. The woman said no and confirmed she wanted to surrender the dog. Randall said she’s heard a variety of reasons why people surrender, but it often has to do with money or moving. "They get new landlords, or they move and they can't take their animals,” Randall said. “Sometimes it's as simple as the cat breaks its leg and they can't afford the medical bills." Because the shelter is beyond full, the city does euthanize potentially adoptable animals for “behavioral” reasons. Indy Cares is funded through donations and helps pet owners keep their animals by paying for medical bills, medicine, food and other needs. “Sometimes just talking to them makes them feel better,” said Randall. Pet owners who get help from Indy Cares have to agree to spay and neuter their dog or cat, provided they’re healthy enough to do so. Indy Cares sees multiple litters a day surrendered to the shelter—a sign the city’s animal overpopulation problem is at a breaking point. "If these people love puppies or kittens or want their kids to see a litter, let us help you spay and neuter your pets and then you can come foster all the kittens and puppies that you want," said Randall. Indy Cares has successfully saved hundreds of animals from coming into the shelter. But the reality is, too many dogs and cats are still being surrendered. 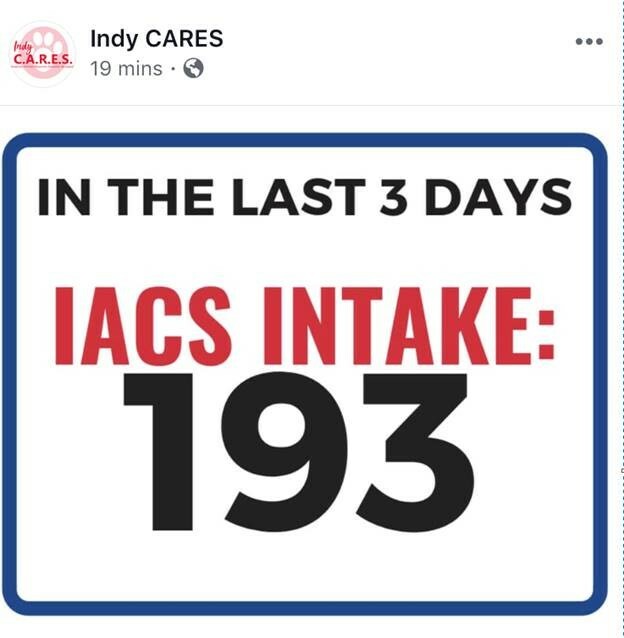 Indy Cares keeps a tally on Facebook, like this October post showing 193 animals went into the city shelter in just 3 days. Call 6 Investigates is lifting the curtain on the city’s animal overpopulation problem. Read more about how taxpayers are footing the bill for this issue .